Hello! I hope you all had a nice week! I think Vegas has gotten more rain in these past 4 days than we have in all last year! Crazy. I can’t believe how much rain California is getting too. Overall this week has been nice, work wasn’t too crazy, I got my committee together for my thesis (finally) and I may be doing a couple cooking classes for Whole Foods! The site is sooo close, but there are a few things that I need help with still, so I just won’t say a date anymore :) ugh. Mon - thanks to the handy dandy bike trainer I rode for about an hour watching SYTYCD & tweeting, all while it was pouring outside. Thurs - 3.5 mile run, progress!! Fri – early morning spin, woot! We’ve been having some yummy eats too. I’ll have to share a crockpot pesto chicken recipe with you soon. I think this was the most tender white meat I’ve ever had. Just melts in your mouth like butta’. And is the bomb for paninis with gooey, crusty pesto cheese. I think I’m on a muesli kick this week and breakfast this morning was pretty tasty! This morning I added some Kashi Warm Cinnamon, 1/4 naner, grapes, peanut butter and Nutella!! oh man the Nutella sent it over the top. Yum! Sorry this is so short, I need to get to studying, researching, getting the site presentable, organizing about 2,000 pictures, making granola bars and prepping food for the week. Kabocha black bean burgers are on the menu tonight! I just wanted to share a couple tasty recipes that I hope you can enjoy with your family and friends or simply in the solace of your own company . . .
Preheat oven to 400 F. Cut squash in half lengthwise, place cut sides down on a foil lined baking sheet. Pour about 1/2 cup water in pan. Bake for about 30 minutes, turn squash over and bake for another 15-20 minutes until tender. I also put a little butter in mine. When it’s done scoop one 1/2 into a bowl and save the other half for another meal. To the bowl with the squash add a splash of rice wine vinegar and toasted sesame seed oil to taste. Sauté the tofu, carrots, zucchini, bell pepper and green onions until tender and browned. Mix the coconut milk and last 6 ingredients in a bowl and microwave to soften, then add to the sauté pan over low to mix. Scoop some spaghetti squash on the plate and top with the curry peanut mixture and enjoy! I really wish we would have had some leftovers! Next on the list of weekend eats is . . .
To make the sauce: Melt the butter in a pan over medium-low heat. Add the flour and whisk. Whisk in the milk. Increase the heat to medium-high. Whisk the sauce until it comes to a simmer and is slightly thick and smooth (may take a bit longer with the lower fat milk). Whisk the salt, pepper, cinnamon and cayenne into the béchamel sauce. Keep warm. Preheat the oven to 400 degrees F. Get out the goods. Whisk the ricotta, basil, Parmesan/Italian cheese mix, laughing cow, prosciutto, pepper and spices to taste in a medium bowl to blend. Boil the noodles until just tender but still firm to bite. Drain. Arrange the noodles in a single layer on a baking sheet to prevent them from sticking. Pour the béchamel sauce over the bottom of a 13 x 9 dish. Spread about 2 spoonfuls of ricotta mixture evenly over each noodle. Starting at 1 end, roll each noodle like a jelly roll. Lay the lasagna rolls seam side down, without touching, atop the béchamel sauce in the dish. Repeat with the remaining noodles and ricotta mixture. Spoon 2-3 cups of marinara sauce over the lasagna rolls (more if you like it saucy). I got this sauce from TJ’s and it was really nice and fresh tasting unlike most jarred sauces. Cover tightly with foil. Bake until heated through and the sauce bubbles, about 20-25 minutes. Uncover, sprinkle with cheese and bake until the cheese on top becomes golden, about 10-15 minutes longer. Let stand for 10 minutes (if you can stand it) and serve! We had a salad on the side with romaine, cranberry goat cheese and walnuts, along with a glass of J. Lohr Merlot. It is a nice red, slightly toasty with notes of dark cherry and plum. It is pretty reasonably priced too. We played the tasting game with a cute notepad I picked up at Anthro called ‘Rate that Wine’. This would be great fun for parties too. I had 1 1/2 rolls with the salad and a small glass of wine. After dinner I grabbed a coconut water and we curled up on the couch to watch a movie, but fell asleep not even half way through! Ah well, this usually always happens with us! With the terrible tragedy that has hit Haiti and continues to trouble their existence, Diana from The Chic Life has developed another great idea to help. She will be hosting a bake sale coming up around January 27th, and all the online bidding proceeds will go to the Red Cross Relief Fund. I have volunteered to bake up a big batch of Gina’s awesome granola and it looks like there are some other tasty goods being made as well. I may just have to bid on some myself! 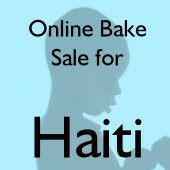 Check out the details here if you’d like to become a baker or a bidder. I just can’t imagine what they are going through right now. While they have had many donations made, it’s been tough actually getting the supplies to them. I feel so blessed to be safe and have access to all of life’s necessities. Thanks for all your help!